Happy weekend! It's gorgeous warm and sunny weather by me, how about you? I'm slowly getting over the jet lag..ok..I would have been over it in a day, it is only 3 hrs, but my kids? Ugh. Wreaking havoc on their little bods, and therefore mine. So, I'm slowly catching up on swatches and have these beautiful Fair Maiden shades which is a newish brand that I'd never tried before. I have the complete set of 9 shades in the Garden Party collection to show you! Fair Maiden Gilded Garden - a strikingly metallic polish with rose gold flecks and a linear holo finish. The only LE of this collection. 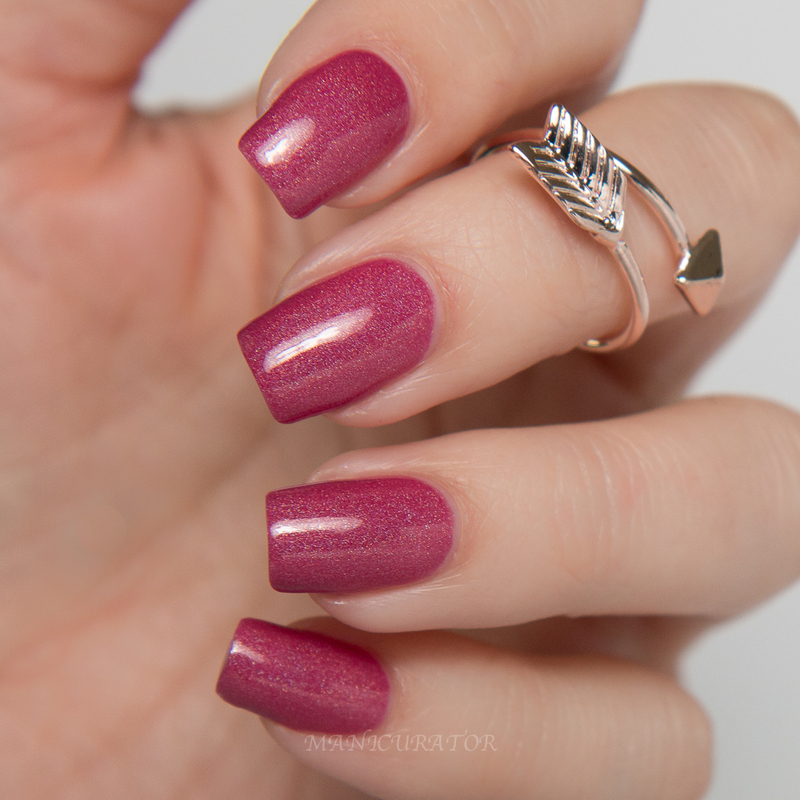 Comes with the signature rose gold arrow ring (which I have shown with the next polish.) *Edit this polish has been replaced with a very similar one for the restock. This shade is an absolute stunner! I'm sure I will be reapplying this one soon! Fantastic formula opaque in 2 coats. Shown with top coat. Fair Maiden Stargazer - inspired by the Stargazer Lily, a classic medium pink-red off set with green flash and soft linear holo. A delicate holo, comes out beautifully in the sunlight! Fair Maiden Sweet Honeysuckle - a soft fleshy creme with golden flash and violet red sparkle. A beautiful shade with gorgeous shimmer! I couldn't get it to photograph quite right, it's a bit lighter and brighter in real life. Good formula, opaque in 3 coats. Fair Maiden Evening Primrose - a pastel yellow creme offset with a deep blue flash. This was the only shade in the collection that I some application troubles with. Even with three coats (and I tried two separate times, thinking the first time it was a fluke) I didn't get consistent opaque coverage. The shade itself is very pretty, a bit brighter and more lemon yellow than my photos show. Fair Maiden Green Goddess - inspired by the Green Goddess Calla Lilly it is a light green polish rich in holo and kissed with a golden flash. No complaints here, and that's saying a lot cause well, you know..it's green :P This has a stunning holo and very wearable green shade. Fair Maiden Mint Succulent - a soft seafoam green-blue polish with a strong violet orange flash and linear holo. Whoah. This baby is super duper pretty, looks more complex on the nail than in photos and a strong holo in the sun. I cannot wait to get this one on again. I used 3 coats. Fair Maiden Blue Moon Wisteria - a medium deep blurple creme offset with a strong violet purple flash. This one was much harder to capture in photos. I did some color correcting in the editing phase and it's just about right. Those blurple shades are a fine line between looking blue vs looking purple at any moment! Excellent formula, opaque in 2 coats. 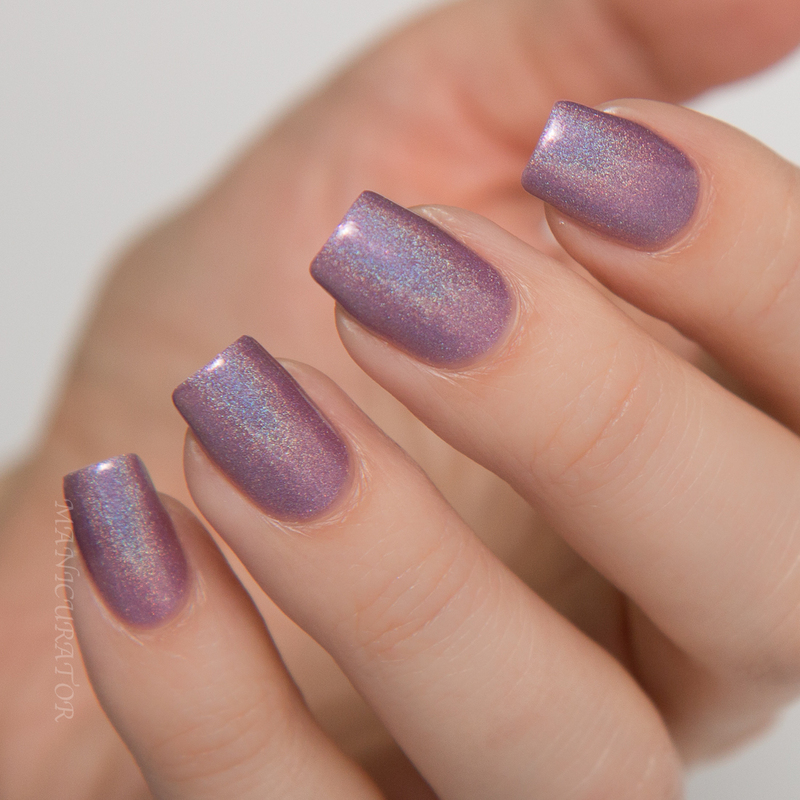 Fair Maiden Neptune Rose - a bright orchid creme with turquoise flash and violet sparkle. Beautiful shade (I feel like I sound like a broken record! But this collection is full of beautiful shades!) I used 3 coats here. Fair Maiden Maiden's Blush - inspired by the Maiden's Blush Lilac, a light purple with intense linear holo and hints of violet red sparkle. Another beauty for sure! The holo in this shines even in low light! So pretty!! Such a beautiful collection! These might have to be my first Fair Maiden purchases! Some gorgeous and delicate shades in here! Sweet Honeysuckle and Maiden's Blush are amazing! I don't know if I have heard of this brand yet, so thanks for sharing! Ugh so hard to pick a favourite! I love all of them! I'd have to go with Sweet Honeysuckle or Mint Succulent but they are all amazing. Gorgeous swatches! Blue Moon Wisteria and Maiden's Blush are my favorite, but most of these look amazing! Love the brand label as well. So many lovely soft shades! And your swatches are stunning, as always! I think Stargazer is my favorite as well. I love them ALL !! Impossible for me to tell you which one is my favorite :D Your swatches are perfect ! Amazing swatches! I'm so glad to have a few of these beauties on the way to me! They all look amazing on your gorgeous nails, hun! Stargazer and Sweet Honeysuckle are def my favourite - so, so purrty! These are all gorgeous colors!! Will I have the honor of meeting you at the Pacific Northwest get together I have scheduled for this Saturday? Great swatches and beatiful colors!